North Carolina is one of 18 states that do not have a telemedicine parity law, which forces insurance companies to pay health care providers for services treated via telemedicine that are otherwise covered during an in-office visit. While most states have such laws, their unintended consequences perpetuate the worst features of our nation’s health care system. Parity laws may impede the creation of a treatment plan that meets the needs of individual patients, raise costs, and conceal the cost of care from the consumer. Telemedicine is thriving in nonparity states like North Carolina, suggesting that the cost and burdens imposed by telemedicine parity laws would likely exceed any benefit. Accessing a health care provider is even more difficult for patients living in rural areas. 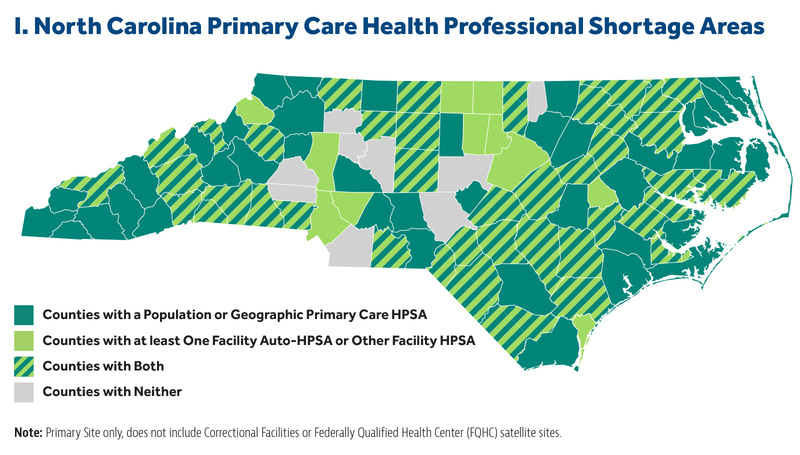 According to the Health Resources and Services Association, 20 percent of Americans reside in rural areas, and just 11 percent of the nation’s physicians practice rural medicine.4 North Carolina alone has documented 145 primary care shortage areas 5 across the state. Whether or not Congress reaches a consensus on policies that address gaps in health care access, it’s important to emphasize how the market is responding efficiently to this critical issue. Telemedicine, a multibillion-dollar industry, is a leading innovation that has proven to expedite the delivery of health care. As case studies and statistical analyses illustrate the benefits of telemedicine, more rigorous evaluation and data are needed to determine its overall impact on health care cost, quality, and access.12 That said, disciplines that assess the impact of technology on institutions and enterprises encounter the same problem: Advancements in technology often outpace the production of peer-reviewed research. By the time such research is published, the technological landscape has likely changed in a way that limits practitioners’ and policymakers’ ability to employ its findings. That is why policy studies and industry reports are critical to the study of activities that employ advanced technologies. Research also shows that telemedicine helps reduce depression levels for patients who access psychiatrists and psychologists at a distance compared to patients who receive mental health treatment from on-site primary care providers and nurse managers.14 Patients diagnosed with depression are also engaged in more self-management activities as encouraged by telehealth providers. 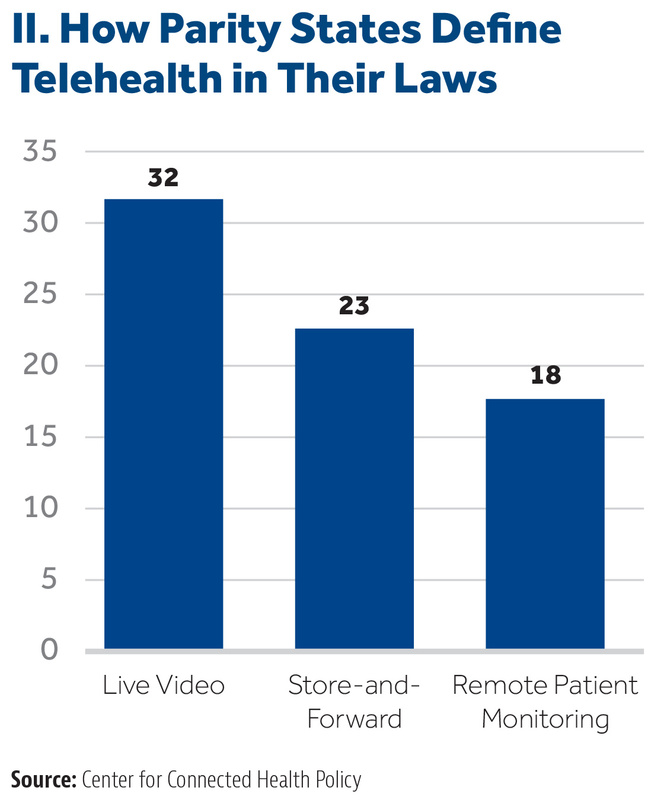 The lack of uniformity across states’ rules on telemedicine also impacts the types of telemedicine that providers can use for patient care. 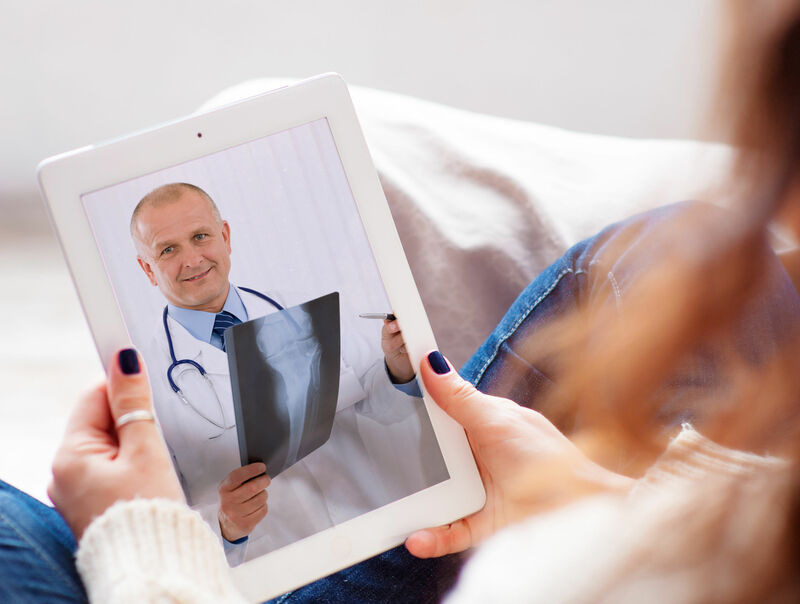 According to the Milbank Foundation’s assessment of state telemedicine parity laws, all require virtual visits to be covered. Seventy-two percent also recognize services delivered through asynchronous or store-and-forward platforms, while just over half mandate remote patient monitoring.19 See Chart II. Variations across state parity laws also make it possible for private health insurers to have flexibility in determining which telemedicine services they choose to cover. If statutory language states that an insurer shall pay for telemedicine benefits based on its “terms and conditions,” then the insurer arguably has more discretion over what telemedicine services are deemed appropriate for reimbursement.22 Parity law language in states such as Kentucky and Georgia share similar “terms and conditions” clauses.23 24 Others are not as fortunate, meaning that state governments may have more leverage in dictating what types of telemedicine is to be paid for. The laws do not mandate the health plan provide entirely new service lines or specialties. The scope of services in the plan’s member benefits package remains unchanged. The only difference is that the patient can elect to see his or her doctor via telehealth rather than driving to the doctor’s waiting room. On the other hand, “full parity” forces insurers to pay providers for services treated via telemedicine at the same rate those services are billed for in an office setting. The concept of partial parity seems to contradict private insurers’ concern that these laws resemble another health benefit mandate. However, further examination on the evolution of parity laws does indeed add credibility to private insurers’ opposition. Parity laws set a precedent for state governments to further meddle in private enterprise by forcing insurers to pay for other telemedicine services that are beyond the scope of their original plan design. While the program produces positive results, it’s important to emphasize that payers, not the government, should have the freedom to choose which telemedicine services to invest in. When asked if they considered expanding their current telehealth policies, several interviewees voiced caution. They noted concerns about efficacy in certain interactions. Most preferred a slower, more thorough approach to expansion that could include their own pilot projects before considering larger changes. While we did not sense any reluctance on the part of interviewees to move forward with telehealth, it was evident that the interviewees only wanted to reimburse for services for which they felt telehealth could appropriately be used, such as routine office visits. Full parity not only prevents telemedicine from being cost-effective, it also shields patients from the actual cost of care. A lack of price transparency across the nation’s health care system is what keeps health care costs high. Where price transparency does exist in the health care space, the telemedicine market has proven that most primary care needs can be affordable when paid for out of pocket. In the end, telemedicine parity laws perpetuate the shortcomings of our current health care system. They may disincentivize the creation of a treatment plan that meets the needs of individual patients. They may raise costs and conceal the cost of care from the consumer. And they may encourage the overconsumption of health care by paying providers based on the volume of services and not outcomes. For the convenience that telemedicine offers without compromising the quality of care, some medical providers are still resistant to adopting the practice because certain services don’t always come with insurance reimbursement. Such pushback is one of the reasons why 32 state legislatures have passed telemedicine parity laws. 40 41 Telemedicine parity laws force private insurance carriers to cover treatment via telemedicine that is otherwise covered during an in-office visit. Yet, it’s a false notion to think that a state is lagging in health care innovation if it has not enforced a parity law. North Carolina and surrounding nonparity states in the Southeast are in fact engaged in many telemedicine initiatives that span multiple levels of care. The DHHS report that was submitted in October 2017 does not provide definitive suggestions regarding private-payer telemedicine laws. In fact, the report specifically asks for the N.C. Department of Insurance to weigh in with its own comments. It is admirable the General Assembly wants to advance legislation that encourages more medical professionals to adopt telemedicine so patients can access care without having to travel long distances. Telemedicine private-payer laws are well-intentioned and generally receive overwhelming bipartisan support. However, private insurers are likely not to endorse yet another law that further erases their authority in designing health plans. Enacting telemedicine parity only adds to the growing list of health benefit mandates44 insurers must include in their small-group and individual consumer policies. To that end, it’s important for state policymakers to be fully informed about these laws and be mindful of how they conflict with market-oriented health policy principles. BCBS NC has also partnered with telemedicine startups that aim to prevent unnecessary visits to the emergency room and other costly health care settings. Mosaic Health, a subsidiary of BCBS NC, invested $4 million in TouchCare, a company based in Durham, N.C.47 48 Like many telemedicine apps, TouchCare connects patients to physicians through a secure virtual platform. Patients can download the app at no cost and gain access to providers at FastMed Urgent Care locations and mental health providers affiliated with Carolina Partners. Compared to government payers, private insurers operating in North Carolina and other states grant providers and patients more flexibility in how virtual visits are conducted. Both UnitedHealth Group and Blue Cross, for example, allow patients to use telemedicine platforms to connect with an in-network physician from any location, including work or home. Whether or not insurers reimburse for telemedicine services, some physicians are proving that health care needs provided through various forms of telemedicine are affordable when consumers pay for them out of pocket – again, eliminating the need for private-payer parity laws. RelyMD is a telemedicine app founded in 2015 by an independent emergency physician group in North Carolina.51 52 The startup’s board-certified physicians offer 24/7 virtual doctor appointments to their users in exchange for a $50 per-visit fee. Patients can seek medical consultation or treatment in the comfort of their own homes via a computer, smartphone, or tablet in a matter of minutes. Not only is RelyMD convenient for a busy parent with a sick child who cannot wait an average 19 days to be seen in person by a family physician53, but the cost is also a significant discount compared to an urgent care visit or a minimum $1,000 trip to the emergency room. Health care providers who embrace the Direct Primary Care (DPC) model aren’t letting fee-for-service payment policies dictate how they practice medicine. They’ve opted out of insurance contracts altogether, freeing themselves from the rigid structure of billing codes, modifiers, and prior authorizations. 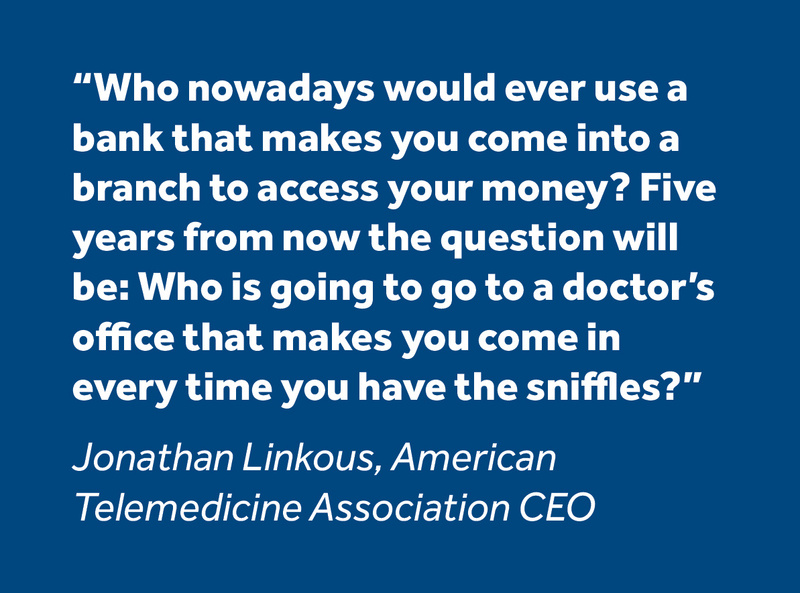 Instead, they contract directly with their patients, providing all of their primary care medical needs in exchange for an average $75 monthly fee.55 Phone calls, texts, emails, FaceTime, secure messaging platforms, and specialty consults – the most common uses of telemedicine – are included in a patient’s membership package. One of the defining characteristics of DPC is that these physicians keep their practices small so they can spend more time with their patients.56 Telemedicine further restores their physician-patient relationship by extending access to health care beyond the exam room. Some DPC practices in North Carolina use Spruce Health, a secure messaging platform that lets these physicians have continuous conversations with their patients.57 They can respond to inquiries ranging from which vitamin D tablet to buy, to feedback on a diabetic patient’s reported blood sugars. Another telemedicine benefit many DPC patients have access to at no additional cost to their membership are e-consults or online consultations for specialty care.59 When physicians question whether their patient’s condition is beyond the scope of their practice, e-consults give them guidance to determine if specialist referrals are necessary. While various health care professionals use e-consults, this form of telemedicine pairs exceptionally well with DPC. E-consults assist DPC physicians in fulfilling their value proposition that most health care needs can be managed thoroughly in a primary care setting. And because they can spend more time with their patients, e-consults are a tool to help them reduce the 40 percent of specialist referrals that could, in fact, be managed by a primary care physician.61 The DPC model proves that practicing medicine is much more flexible when it bypasses the complexities associated with health insurance. They can be creative with designing primary care membership plans that feature built-in benefits that patients will value – like telemedicine. As hospitals adjust to the shift from fee-for-service reimbursement to risk-based contracts, or when providers are rewarded or penalized based on cost savings and patient health outcomes, telemedicine is a powerful tool to help health systems achieve desirable results. Another direct-to-consumer telemedicine startup is MDPlus. Established in Clearwater, Florida, the company offers three different “around-the-clock” medical consultation plans for individuals and businesses. The basic plan, for example, costs $20 per month in addition to a $35 consultation fee when a customer connects with a health care provider for nonurgent medical needs.82 MDPlus also brings transparency to the health care market with its patient advocacy services. Representatives provide customers with price comparisons for medical procedures, equipment, and prescriptions. A nationally recognized Center for Telehealth Excellence, the Medical University of South Carolina (MUSC) is known for its school-based telehealth program. Starting in 2013, a $12 million General Fund appropriation and a grant from the Duke Endowment has helped MUSC providers connect with students in more than 50 schools across the state.83 84 Schools are equipped with telehealth carts that come with computer monitors, digital stethoscopes, and otoscopes. With these tools, physicians can examine a student’s nose and ears and listen to his or her heart and lungs in real time from a distance. Other hospitals in the state have launched school-based telehealth networks.85 Since 2015, one of Greenville Health System’s nurse practitioners makes on-site rotations at one of four elementary schools in Greenville. If a student needs a prescription and the nurse practitioner is not physically present, the school nurse can receive approval online by the nurse practitioner. Since 2016, Anthem Blue Cross and Blue Shield customers in West Virginia can engage in virtual visits with nurse practitioners affiliated with the Cleveland Clinic.86 Unlike other companies that offer virtual telemedicine services, Anthem’s policyholders can select their provider before their consultation. It is admirable that the General Assembly wants to advance legislation that encourages more medical professionals to adopt telemedicine so patients can access health care without having to travel long distances. However, the examples above illustrate that it’s a mistaken notion to view North Carolina and other nonparity-law states as lagging in telemedicine innovation. Lawmakers should also be fully aware of the unintended consequences that can result from parity laws. While studies suggest that telemedicine delivers quicker, cost-effective health care without compromising quality, more research is needed to look at how private-payer laws impact the health insurance market. To that end, private insurers themselves should decide to invest in telemedicine services on behalf of their policyholders – not the government. Instead of expanding telemedicine by imposing more regulations on insurance companies, North Carolina lawmakers should focus on the removal of licensure barriers that limit telemedicine’s growth. Lawmakers and regulatory boards should be commended for the progress that’s already been made in this regard. Moving forward, policymakers can also consider legislation for North Carolina to become an affiliate of the Interstate Medical Licensure Compact (IMLC).95 96 Sponsored by the Federation of State Medical Boards (FSMB), the compact permits physicians to pursue an expedited medical licensure process if they choose to practice medicine – including telemedicine – in other compact states. 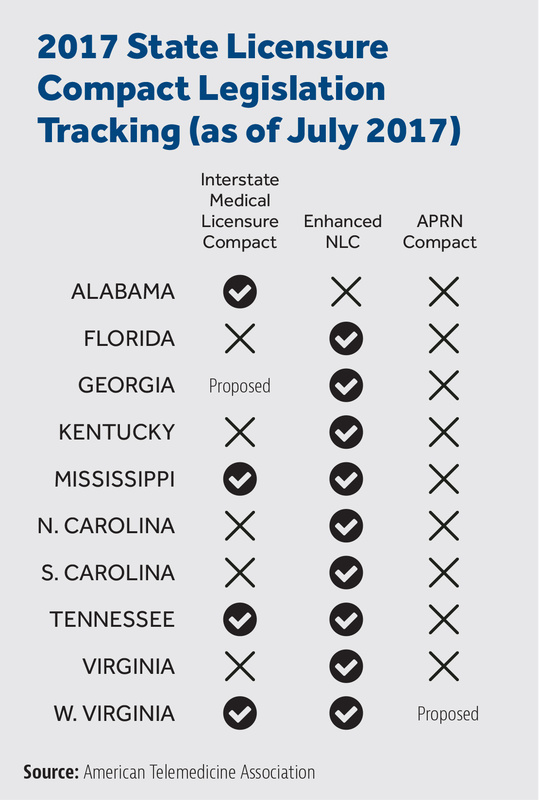 While the IMLC expedites the medical licensing process, it’s important to mention that physicians are still bound to each compact state’s rules on the practice of medicine and telemedicine. Thus, the compact doesn’t allow for portability. It upholds the standard that physicians can deliver care only to patients who are in states where they are licensed. 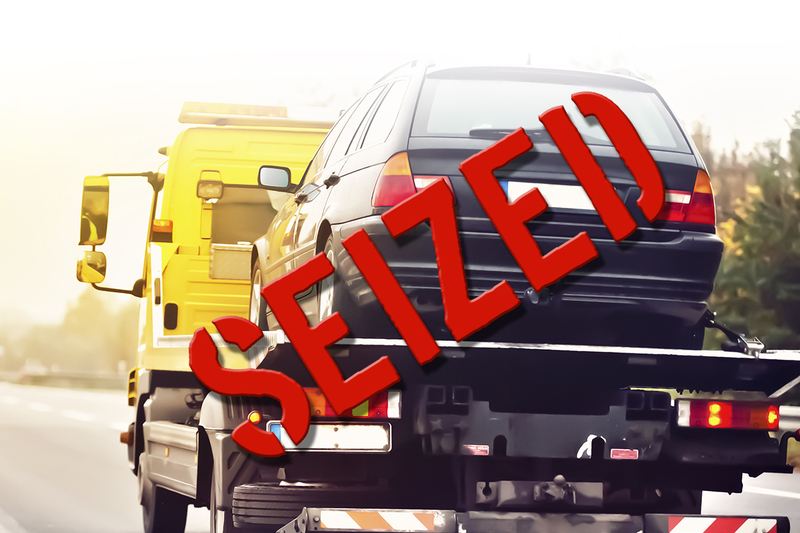 These restrictions could distance physicians from opting into the compact. If North Carolina lawmakers do pass model legislation to create an Interstate Commission, it’s paramount that the agency’s appointees make it attractive for physicians to the extent that it can. For example, it would be wise to keep application and renewal fees to a minimum. To make the telemedicine marketplace more accessible and competitive, a simpler policy solution would be for the state legislature to urge Congress to pass a law stating that the practice of telemedicine be tied to where the provider is located, not to the patient.99 As previously mentioned, physicians can deliver telemedicine only to patients who are physically located in the state where the provider is licensed. If payment is instead tied to the provider’s location, then the provider could deliver care to patients anywhere. Such a policy change would completely obviate the need for the interstate medical licensure compact because physicians would merely have to comply with one home-state medical license.100 Removing cumbersome and expensive licensure barriers would fulfill telemedicine’s mission to democratize access to health care. In sum, while this report recommends that lawmakers consider legislation that would make North Carolina an affiliate of the Interstate Medical Licensure Compact, participation should be considered if Congress fails to pass a law specifying that telemedicine occurs where the provider, not the patient, is located. As mentioned above, this would allow providers to deliver care to patients anywhere, that is, allow health care providers to serve patients across state lines. Our health care system is a legal and regulatory labyrinth created by Congress and federal bureaucrats that reflects their unwillingness to allow insurers, providers, and consumers to operate freely in the marketplace. 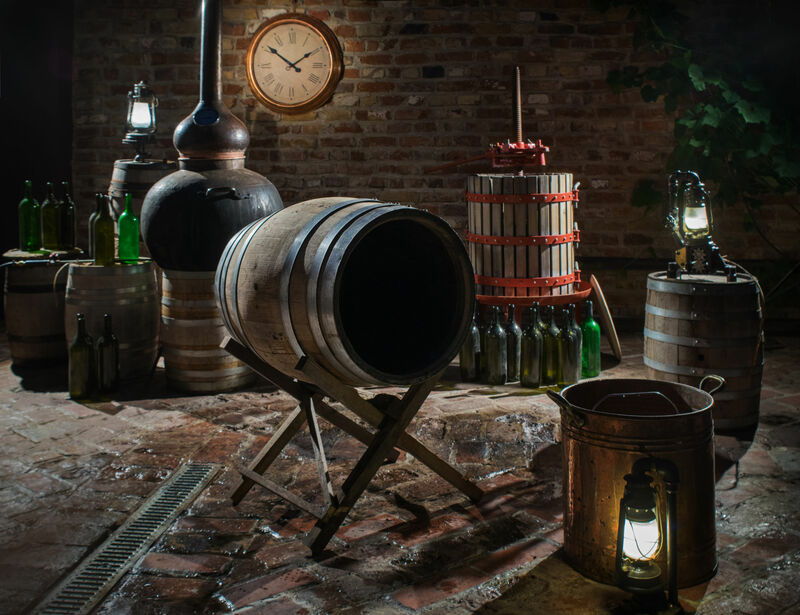 Instead, they are subject to regulations so convoluted and voluminous that violating some minute and likely contradictory provision is all but guaranteed. State lawmakers need not follow suit. States are the last line of defense for sustaining the remnants of a market recklessly imperiled by the federal government and eventually rebuilding a health care system that is responsive to the needs of providers and consumers. When it comes to a telemedicine parity law, I am proposing a radical course of action for the North Carolina General Assembly – do nothing. Telemedicine will continue to thrive in North Carolina without a parity law. If given a choice between the free market and adding a law or mandate to the health care system, government should err on the side of the free market. Merritt Hawkins 2014 Survey: Physician Appointment Wait Times and Medicaid and Medicare Acceptance Rates. 2014. Thomas Bodenheimer, M.D., and Laurie Bauer, R.N., M.S.P.H. “Rethinking the Primary Care Workforce — An Expanded Role for Nurses.” New England Journal of Medicine. Sept 15, 2016. “Closing The Gaps In The Rural Primary Care Workforce.” National Conference of State Legislatures. 2017. “Meeting The Primary Care Needs Of Rural America: Examining The Role Of Non-Physician Providers.” National Conference of State Legislatures. 2017. “Primary Care Health Professional Shortage Areas (HPSAs).” The Henry J. Kaiser Family Foundation. December 31, 2016. Katherine Restrepo, “As Senate GOP Fumbles Health Reform, Telemedicine Delivers Better Access To Health Care.” Forbes. July 27, 2017. “History of Telemedicine.” MD Portal. Sept. 23, 2015. Marilyn J Field, “Telemedicine: A Guide To Assessing Telecommunications for Health Care.” Institute of Medicine. National Academies Press. 1996. Jacqueline Howard, “The doctor will ‘see’ you now: Online vs. in-person vision tests.” CNN. March 15, 2017. Sheila Fifer, PhD, Wendy Everett, ScD, Mitchell Adams, Jeff Vincequere, “Critical Care, Critical Choices: The Case for Tele-ICUs in Intensive Care.” The Massachusetts Technology Collaborative and The New England Healthcare Institute. December 2010. Kate Blackman et al, “Telehealth Policy Trends and Considerations.” National Conference of State Legislatures. Dec. 2014. G Flodgren, A Rachas, AJ Farmer, M Inzitari, S Shepperd, “Interactive telemedicine: effects on professional practice and health care outcomes.” Cochrane Database of Systematic Reviews. 2015. John C. Fortney et al, “Practice-based versus telemedicine-based collaborative care for depression in rural federally qualified health centers: a pragmatic randomized comparative effectiveness trial.” American Journal of Psychiatry. April 2013. Center for Connected Health Policy, “Telehealth Private Payer Laws: Impact and Issues.” Milbank Memorial Fund. August 23, 2017. “Telemedicine Mandates and Parity in the Private Market: Summary of State Laws.” America’s Health Insurance Plans. Sept. 30, 2014. Telemedicine Regulations in Georgia. Chiron Health. 2017. Tennessee House Bill 1895. 2014. “State Telehealth Laws and Reimbursement Policies.” Tennessee. Center for Connected Health Policy. April 2017. “State Telehealth Laws and Reimbursement Policies.” Mississippi. Center for Connected Health Policy. April 2017. Matthew Loughran, “Telemedicine Reimbursement Laws Challenge Insurers and Providers Alike.” Bloomberg News. Oct. 17, 2017. Kentucky Telehealth Administrative Regulations. Accessed Sept. 10, 2017. “State Telehealth Laws and Reimbursement Policies.” Georgia. Center for Connected Health Policy. April 2017. Nathaniel Lacktman, “Examining Payment Parity in Telehealth Laws.” Health Care Law Today. Aug. 13, 2015. “Telehealth Parity Laws. “ Health Affairs Health Policy Brief. Aug. 13, 2015. “Laws and Regulations for Telehealth.” Mississippi Telehealth Association. Accessed Sept 2017. Senate Bill 2646. Mississippi Legislature 2014 Regular Session. July 1, 2014. Neil Versel, “Mississippi telehealth, remote monitoring pays dividends for diabetics.” Sept. 13, 2016. MedCity News. Kentucky TeleHealth Update provided by the Kentucky Health Information Exchange. Accessed October 10, 2017. Kentucky Telehealth and Telemedicine Laws. Kentucky Telehealth Board. May 2017. “Telemedicine Mandates and Parity in the Private Market: Summary of State Laws.” Kentucky. America’s Health Insurance Plans. Sept. 30, 2014. Telehealth: Helping Hospitals Deliver Cost-Effective Care. American Hospital Association. April 22, 2016. Ana B. Ibarra,“Are Virtual Doctor Visits Really Cost-Effective? Not So Much, Study Says.” Kaiser Health News. March 7, 2017. Eric Wicklund, “Kaiser CEO: Telehealth Outpaced In-Person Visits Last Year.” mHealth Intelligence. Oct. 11, 2016. Katherine Restrepo, “Telemedicine Pairs Well With Direct Primary Care.” Forbes. Sept. 18, 2017. Tony Yang, “Telehealth Parity Laws.” Health Affairs Health Policy Brief. August 15, 2016. Latoya Thomas and Gary Capistrant, “State Telemedicine Gaps Analysis: Coverage and Reimbursement.” American Telemedicine Association. Feb. 2017. North Carolina Department of Health and Human Services, “Telemedicine Study and Recommendations. SL 2017-133, Section 2.” October 1, 2017. House Bill 283. North Carolina General Assembly Session 2017. Katherine Restrepo, “Want Affordable Health Insurance? Scale Back on Benefit Mandates.” John Locke Foundation. June 14, 2017. Darcie Dearth, “The Big Telemedicine Trend: More Coverage, New Innovations In NC.” Blue Cross and Blue Shield of North Carolina Blog. Aug. 19, 2015. Aditi Pai, “UnitedHealthcare Now Covers Doctor On Demand, American Well Video Visits Too.” mobi health news. April 30, 2015. John Murawski, “Durham startup TouchCare’s telemedicine service gains key backer.” News & Observer. Dec. 20, 2014. Jennifer Henderson, “Durham telemed startup has new mental health partnership.” Triangle Business Journal. Dec. 7, 2016. “State Telehealth Laws and Reimbursement Policies.” North Carolina. Center for Connected Health Policy. April 2017. “Realizing the Promise of Telehealth: Understanding the Legal and Regulatory Challenges.” American Hospital Association. May 2015. Amy Huffman, “Can ER Doctors’ Startup Make Telehealth Ubiquitous in North Carolina and Beyond?” ExitEvent. April 27, 2016. “Average wait time to schedule physician appointment longest in Boston.” Healio. Jan 29, 2014. Steve Huffman, “RelyMD partners with Piedmont Health for after-hours coverage.” Triad Business Journal. Dec. 2, 2016. Katherine Restrepo, “Direct Primary Care: A Simple Health Care Model Designed To Help Patients With Chronic Disease and Disabilities.” John Locke Foundation. March 22, 2017. David Craig, “Spruce Visits: Improve Your Practice with Efficient Telemedicine.” Spruce Blog. July 20, 2016. Roy PC Kessels, PhD, “Patients’ Memory For Medical Information.” Journal of the Royal Society of Medicine. 2003. Frank Irving, “E-consults Hold Promise For Efficient PCP And Specialist Interaction.” Healthcare IT News. Nov. 29, 2011. “Evolution of Consumer Driven Health Plans Blog Series: Part 2.” Paladina Health. January 20, 2016. “Virtual ICUGoes Live at Blue Ridge HealthCare.” Dec 4, 2013. YouTube. Jennifer Thomas, “Carolinas HealthCare adds virtual component to intensive care.” Charlotte Business Journal. May 2, 2013. Michael Tomsic, “Staffing An Intensive Care Unit From Miles Away Has Advantages.” National Public Radio. May 6, 2015. “Virtual Critical Care.” Jan 12, 2017. YouTube. Eric Wicklund, “Mercy Virtual Aims for a National Telemedicine Network.” mHealth Intelligence. Feb. 12, 2016. Julianne Pepitone, “The $54 Million Hospital Without Any Beds.” CNN Money. Sept. 13, 2016. Eric Wicklund, “Mercy’s Telemedicine Network Is Growing.” mHealth Intelligence. May 23, 2016. Southeast Alabama Medical Center Foundation. Itemized List of Donations, inclusive of stroke initiative telemedicine units. Southeast Alabama Medical Center Stroke Care Network Powerpoint Presentation. Alabama Rural Health and TeleHealth Summit. Oct. 17, 2013. Amy Yurkanin, “Dialing up the doctor: Telemedicine gets a vital boost in Alabama.” AL.com. March 14, 2016. Eric Wicklund, “It All Adds Up: Telestroke Services Save Lives.” mobi health news. July 1, 2013. Katherine Davis, “Blue Cross and Blue Shield of Alabama will pay for telemedicine services.” Modern Healthcare. December 1, 2015. Erica Garvin, “Teladoc’s CEO Talks What Telehealth Means for the Future of Healthcare.” HIT Consultant. December 9, 2015. Amedeo d’Amore, “11 top telemedicine businesses that can help save healthcare.” Hottopics.HT. Accessed Sept. 18, 2017. Brian Bandell, “MDLIVE to hire dozens in Sunrise after partnership with Cigna.” South Florida Business Journal. April 23, 2013. Eric Wicklund, “Cigna announces telehealth partnership with MDLive.” mobihealth news. April 23, 2013. Jessica Harper, “Pros and Cons of Telemedicine for Today’s Workers.” U.S. News & World Report. July 24, 2012. Dawn Brazell, “MUSC receives $12.4 million for telemedicine program.” Medical University of South Carolina Public Affairs and Media Relations. Aug. 2, 2013. “Telemedicine Improves Access to Care in SC.” South Carolina Hospital Association. Marina Ziehe and Tabitha Safdi, “Technology Extends Health Care to S.C. Schools.” South Carolina Public Radio. April 3, 2017. Reed Abelson, “American Well Will Allow Telemedicine Patients to Pick Their Doctor.” The New York Times. My 16, 2016. Brittany Murray, “iSelectMD, PEIA partnership to provide telemedicine services for over 180,000 members.” The Exponent Telegram. Feb. 12, 2017. “Charleston Area Medical Center Reduced Congestive Heart Failure Readmissions with Patient Engagement Technology.” Telehealth Services Press Release. Feb. 9, 2017. Taylor Mallory Holland, “How Patient Entertainment Systems Boost Satisfaction and Health Outcomes.” Insights. April 29, 2016. Nurse Licensure Compact. North Carolina Board of Nursing. Accessed October 17, 2017. “Governor Cooper Signs HB 550 – Enhanced Nurse Licensure Compact.” North Carolina Board of Nursing Press Release. July 21, 2017. Nurse Licensure Compact: Fact Sheet for Faculty and Students. Accessed October 15, 2017. Pulse Clinical Alliance, “Decompressing The Enhanced Nurse Licensure Compact Changes.” Pulse Clinical Alliance. July 17, 2017. Michael H Cohen, “Telemedicine prescribing position softened by North Carolina Medical Board to allow virtual examination and evaluation.” Michael H Cohen Healthcare & FDA Lawyers. Dec 1, 2014. 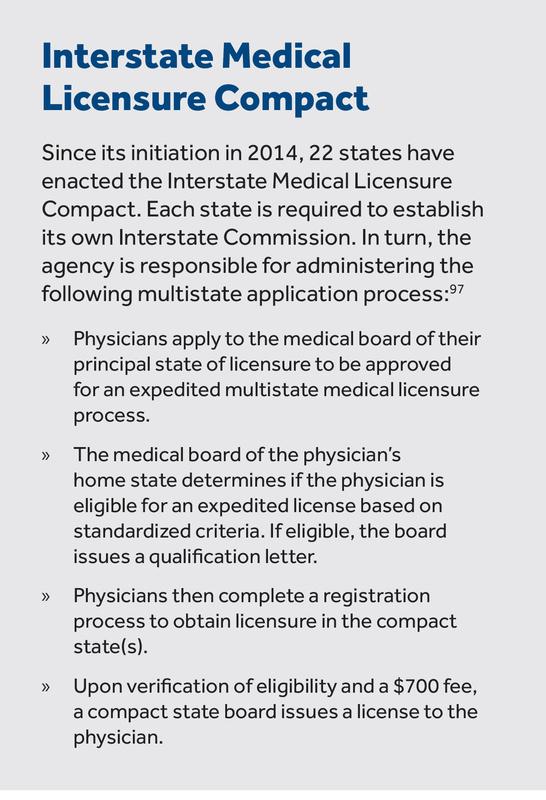 Interstate Medical Licensure Compact Model Legislation. Accessed Sept. 10, 2017. Katie Dvorak, “Interstate medical licensure compact will save physicians time, effort.” Fierce Healthcare. April 24, 2015. Shirley V. Svorny, “Liberating Telemedicine: Options to Eliminate the State-Licensing Roadblock.” Cato Institute. Nov. 15, 2017.